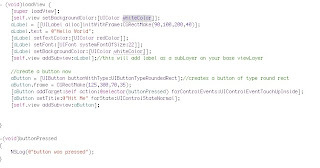 In this post I will create a simple view with a label and a button. The Label says Hello World and a Button which says Hit Me, when clicked prints a log statement on console. I am going to use this project in all my next posts where I will be building complex views, custom table views with custom cells, animations, webViews etc. So open the xCode and create a new project. 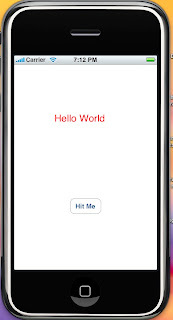 Chose the template "View Based" and name the project as "MyTestProject"
here you are actually creating a Label and initializing it with a frame. A frame represents the lay out of a UI element. The first 2 arguments of CGRectMake are (x,y) coordinates from where the label will appear. The last 2 arguments are (width,height) size and they define how much space will they be taking on the view. Yes a label also has a background color. When you define a frame, you are creating a rectangle with its left corner at the (x,y) and right corner at (x+width, y+height). The label (or any UI element) lies inside a frame. The background color of a label is the color with which this rectangle will be filled. Now in this line we are telling what a button should do on being pressed. addTarget:self tells that the event will be handled by the same class in which it is being declared. action:@selector(buttonPressed) tells that when the button is touchedUPInside this method should be called automatically. Finally we have implemented the method which will be called automatically when the button is pressed. You can write anything inside this method. I have not used Interface Builder at all. For me IB is a pain in the as* . If you want to do some serious development you need to learn how every thing is done programatically. In the next post I will be creating another View and add some more Elements to it and we will be adding code for navigating from one view to the other. Let me know if there is any specific issue. Looking over your tutorials a second time, I remembered a question I had when running this simple program. How do we view the NSLog? I ran the program in the simulator and wasn't to sure how to view it during or after playing with the program. In XCode menu bar, open Run -> Console. It will open console window where you see all you logs. someone suggest good iphoneapp. book for beginner.